I have just seen the documentary film Mountain, a meditative consideration of the rocky and often snow-covered peaks that loom large and magnificent throughout our landscape. Jennifer Peedom’s shots are extraordinary from the outset, almost dizzyingly so. The camera shifts vertiginously from one sequence to the next, the act of the image-capturing itself a marvel how was it even done?!). The text, narrated by Willem Dafoe, and co-written by Robert Macfarlane and Peedom, is understated, and as such aptly complements the sublime images it accompanies. There are many silences, which facilitate a pause, a breath-taking moment to consider the majesty and beauty of what is being revealed. The film is a 76 minute wonderment. I now realise that I have never really used the word s‘awe’ and ‘sublime’ appropriately before. Beyond the sheer physicality of the film, Mountain left me a number of things to reflect on. I guess that this analogy refers to the extraordinary psychological challenge that those who set out to scale the highest mountains face, and one that surely matches if not exceeds the physical demands. But the words made me think too of the sometimes near impossible goals that we set ourselves in our – non-mountaineering – lives. These ‘climbs’ and ‘scalings to the summit’ are often invisible to others, and as a result too infrequently applauded or even acknowledged. I have never climbed a mountain, nor really aspired to. Yet I am utterly compelled by the attempts and feats of others to do so. I have read pretty much every book, and seen every film and documentary on climbing Mount Everest, for example. I tend to seek out ‘me’, and my story, or at least components of it, in pretty much all of the fiction/biography/poetry/cinema that I experience. Consciously or otherwise, I have an innate self-selection process that draws me to stories, whatever the medium, where I might find personal resonance. And so it is with the sublime, and the almost impossible stories of scaling the heights, of getting to the top. I am somewhere in those stories, though my climbing is psychical. The truth is that I am way too fearful to attempt the most novice of physical climbs. But nonphysical challenges hold much less fear for me. I get the adrenaline, the euphoria that these physical risk takers experience – ‘the risk is the reward’. So too for me, but in an infinitely more limited physical microcosm. Secondly, Mountain gives us more serious issues to consider. It encourages us to question why we feel the need to control our environment, to ‘conquer’ it, to make it ours. Getting to the top of Mount Everest does not actually equate with owning anything. In fact, seeing as we do the queues lining up the ascent, you begin to wonder what exactly humans are trying to achieve. My own theory is that we struggle to cope with the unknown, the unattainable, the inexplicable, particularly as so much more is known and explored that it was, say 100, 200 years ago. Uncertainty, a not knowing, has become an anathema to humanity. And thus, we distract ourselves from such uncertainty – which ultimately equates with our eventual nonexistence – by seeking to conquer. If everything is ultimately within our grasp, perhaps mortality might become so, too. A fallacy, undoubtedly, but the illusion somehow fosters a sense of safety. Thirdly, Mountain encourages us to consider the beauty, and fragility of all our lives. Perhaps we have forgotten what it means and feels to be alive, to truly notice our lived experiences, and to be grateful for such awareness. There is a beautiful moment in the film when Dafoe refers to the risks that extreme climbers take on. We truly live when death becomes an almost reality – so close, we can almost feel it. It is at that moment that we are most alive. The German artist Max Beckmann was born on this day, February 12, 1884. 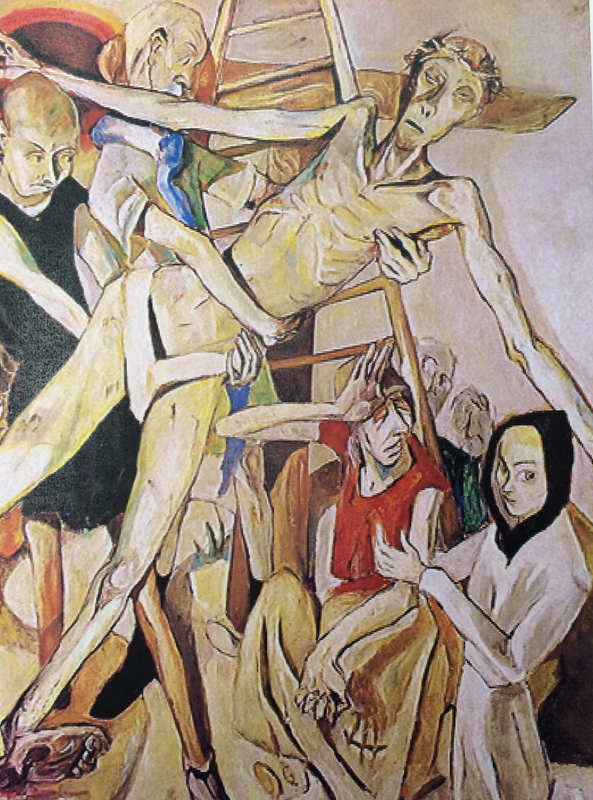 Beckmann suffered for his art, his work ultimately labelled ‘degenerate’ in his homeland by Hitler and Nazism. Forced to leave Germany as a result, he lived in relative poverty in Amsterdam for 10 years. Finally, his visa for the US materialised. His fortunes improved in America, but he died within a few years, in 1950 at the age of 66, from heart disease. Descent from the Cross intrigues and fascinates me. It epitomises the notion of (almost) unbearable suffering, where others, although present, cannot truly bear witness, and avert their gaze. Christ’s body, although pale, emaciated and wounded, seems perversely supersized, as if to emphasise that suffering, represented by perhaps the ultimate icon of human suffering, can overshadow and overwhelm that which it encounters. Modern neuroscience first emerged in the late 1800s, and our interest, both lay and scientific, on how our brains work has increased exponentially since. George W Bush declared the 1990s the ‘Decade of the Brain’. This month, the current US President Barack Obama unveiled a plan to map the human brain. It is not surprising that we humans are so fascinated by the workings of our most invisible organ. Our brains are unique to our selves, and largely define who we are. Yet, an understanding of how they work, what the relationship is between the brain and the mind, continues to elude. Much public and scientific consideration is ongoing, however, snippets of which now regularly appear in the press, whetting our appetites with the tantalising prospect of answering questions on who we are, and what makes us think and behave as we do. One such journalistic piece appeared in The New York Times this month- What the Brain Can Tell Us About Art (http://www.nytimes.com/2013/04/14/opinion/sunday/what-the-brain-can-tell-us-about-art.html?pagewanted=all&_r=0). The writer of the article, Eric R. Kandel, challenges us to consider what we can learn about the mind by examining how we view art. These artistic efforts – explorations of the idea that truth lies beneath the surface – were mirrored at the time in the world of psychoanalysis. Freud, who trained at the Vienna School of Medicine pioneered the practice of using psychoanalysis to explore the subconscious, which ran in parallel with similar explorations by the Austrian modernist painters in their portraits. Kandel draws our attention to this era in terms of how it addressed the question of how art and science might be brought together. The importance of the viewer in the artistic process arises, and with it the notion that art is by definition incomplete without the observer’s involvement and contribution. How we respond to art depends on our own previous and unique experiences, and what our brains remember and store, and also what connections they make. As we look at a picture, we use several interacting systems to analyse and experience what we ‘see’. Our brain’s representation of faces is particularly important when we see and respond to portraits, as our brains devote more space to reading faces than to any other visual analysis. Susan Hiller’s work has long intrigued me, particularly The J. Street Project, in which the artist sought out and photographed all street signs that incorporated the word Jude (Jew) in Germany, finding a total of 303. The work has been described as an ‘expedition into the heartland of loss’ (http://www.susanhiller.org/Info/artworks/artworks-JStreetVideo.html). This rings especially true on visiting Hiller’s current exhibition Channels. 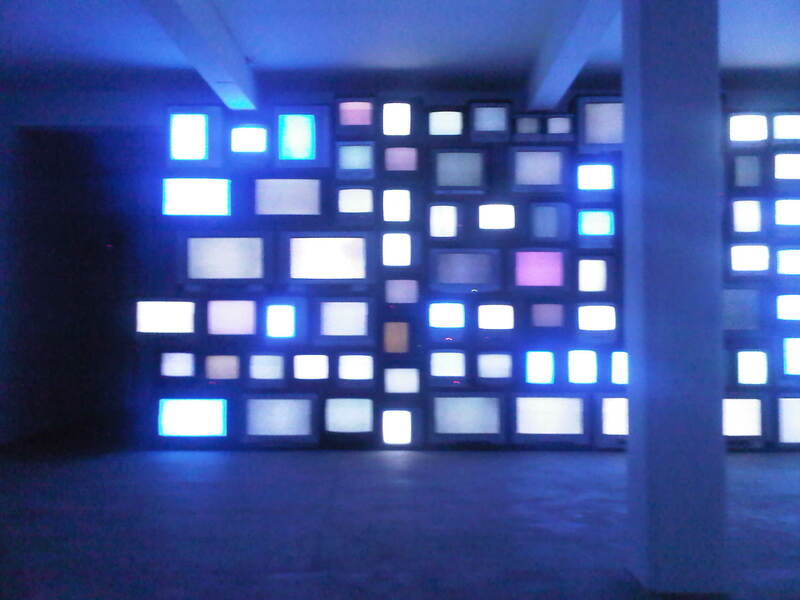 An audio-sculptural installation, Channels is comprised of TV screens, very many screens, stacked on top of each other, displaying mostly monochrome blue or brown colours, occasionally interrupted by static or flickering lines. I sat at the other end of the large white space, initially observing the silent though changing screens. Voices then enter the space, many voices, all speaking at the same time, and in different languages, so that it is almost impossible to decipher the words. The ‘disembodied voices’ are those of people from all over the world as they recount their ‘near-death’ experiences (NDEs). The whole effect is very powerful, not in the sense that it made me consider NDEs in any depth (I have no idea what I feel about them, but whatever anyone experiences must be ‘true’, for them, in some way). What I really value in Hiller’s work, and particularly in Channels, is how she attempts to address issues that we do not understand and therefore often choose to ignore or to dismiss. What I also respect, is how she, like the best documentarists, remains in the background so to speak, allowing her art to facilitate the expression of words and experiences of those who may not otherwise be heard. I love happening upon something or someone in the world of art that I have never encountered before. Such was my experience today, when I visited The Jewish Museum, which I have visited on a number of occasions. This time, I set out specifically to explore the life and art of RB Kitaj. The current exhibition, ‘The Art of Identity’, runs in parallel with ‘Analyst for Our Time’ at Pallant House Chichester, both together constituting the ‘R.B. Kitaj: Obsessions’ retrospective. Kitaj’s work was last seen in London in 1994, when the Tate Gallery held a large retrospective of the artist’s work. The event was one that the artist believed would be the pinnacle of his career, his crowning glory, but instead, art critics almost universally slammed it, apparently with much vitriol at the time. As a result, Kitaj abandoned his adopted England in 1997, and settled in Los Angeles. He never recovered from Fisher’s death. A photograph in the foyer of the exhibition area of Kitaj and Fisher is palpably tender and moving. Kitaj’s first wife committed suicide, leaving him with two children. With Fisher, he had a third child, Max, who was 10 when his mother died. In LA, Kitaj surrounded himself with his sons and later grandsons, but otherwise became increasingly reclusive as he aged. With age too, he became preoccupied by his deteriorating health. He suffered from Parkinson’s disease. and his frailty and consequent difficulty painting affected him profoundly. He was found dead in 2007, with suicide the presumed cause of death. The current exhibition at The Jewish Museum looks at Kitaj’s obsession with his Jewish identity. 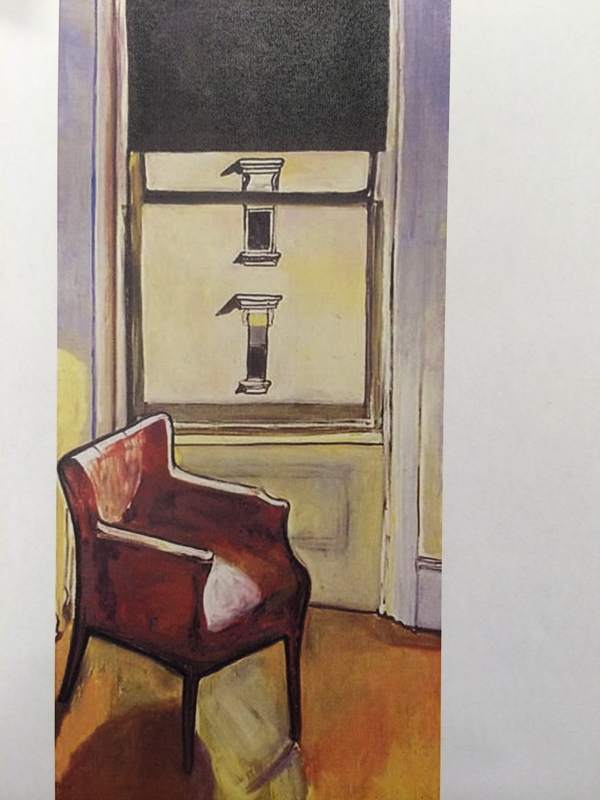 He grew up in a left-wing intellectual home, with his mother Jeanne Brooks and stepfather Walter Kitaj. Neither practiced Judaism. Kitaj’s interest in his Jewish identity began in the 1970s, when he had read Hannah Arendt’s account of the Eichmann trial. Included in the current exhibition is Desk Murder (1970-1984), which appears to have been influenced by Arendt’s Eichmann in Jerusalem, where the author coined the term ‘desk murderer’ for the SS officer Walther Rauff who was responsible for the development of mobile gas vans. In Kitaj’s painting, the outline takes the shape of a van, and features a tap with a cloud of gas streaming from it. The exhibition is small and contained, yet there is much to consider here, from The Listener, which metaphorically depicts the Diasporist Jew, to The Wedding, reminiscent of his marriage to Fisher in a Sephardic Synagogue. I particularly liked some of the portraits of the artist’s friends, for example A Jew in Love (Philip Roth), a charcoal drawing of Kitaj’s writer friend, and Isaiah Berlin. I am not sure I understand much more about Kitaj and his work following my visit, but perhaps the point is not to explain, but to experience what is presented before one’s eyes, and to let the art speak for itself. The artist apparently slashed the work when a friend commented that the portrait was ‘flattering’. Aitchison was persuaded by Martin Wyld, Head of Conservation at the National Gallery, to allow restoration of the painting, yet at the same time retaining the laceration markings. The relined painting, with the slashings clearly visible, remained in the artist’s possession until his death in 2009. Aitchison’s large body of work is very distinctive. He tended to zone in on specific elements, for example animals and birds, portraying them in ‘simplified’ depictions, which were vibrantly coloured. He was particularly interested in the Crucifixion, which is the focus of many of his works. These paintings tend to focus on Christ on the Cross as the sole element in the piece, and, perhaps unusually, the colours remain vivid and bright, far from the sombre tones that more usually define works of art on this theme. I have spoken about Rothko before, both here and elsewhere (http://www.thenewwolf.co.uk/tag/rothko/). Today we heard that the repair needed to restore Black on Maroon, which was defaced during a graffiti attack at Tate Modern in October this year, could take at least 18 months. The reason for this, is that the ink from the pen used in the act leaked deeper than first realised. In addition, as Rothko’s technique was that of painting layer upon layer, the damaged portion will need to be stripped and restored in the same manner. Just last week, another painting of Rothko’s, No. 1 (Royal Red and Blue), was sold at Sotheby’s New York for $75.1 million, the second-highest price ever paid for a Rothko piece. The anticipated sale figure had been $35 to $50 million. ‘Rothko said his paintings begin an unknown adventure into an unknown space… Everything Rothko did to these paintings – the column-like forms suggested rather than drawn and the loose stainings – were all meant to make the surface ambiguous, porous, perhaps softly penetrable. A space that might be where we came from or where we will end up. Rothko committed suicide in 1970. We will never know, or cannot even speculate, what he would have thought of the current events that surround his legacy, his art. Watching the Culture Show on BBC iplayer (http://www.bbc.co.uk/iplayer/episode/b01ny2y7/The_Culture_Show_2012_2013_Episode_19/), I was particularly interested in the piece on John Bellany, currently the most celebrated of contemporary Scottish artists. The piece links to a major retrospective on Bellany’s work, ‘A Passion for Life’, which has just opened at The National Gallery Scotland. The artist, at 70, is as productive as ever, if not more so. Bellany’s life has been a turbulent one, dominated early on by alcoholism, which led to a successful liver transplant in 1988. What helped him through his suffering and pain, and since, has been art. He does not separate his work from the personal, believing that this is what in fact defines fine art. In 2010, the documentary Bellany – Fire in the Blood by the artist’s son Paul was first screened. It is the moving story of a family imploding due to Bellany’s alcoholism, and then coming together again. The artist absolutely believes that painting has saved him. Following his transplant, his work changed, becoming more colourful and vibrant. He suddenly saw the world in cinemascope, whereas previously it had been cloaked in a haze. Of painting, Bellany at 70 says ‘I love it so much’. …currently has his first solo London exhibition, at the Hua Gallery, Battersea (until December 20). Sheng Qi is perhaps most remembered for cutting off the little finger of his left hand following the events in Tianaman Square in 1989. Thematically, self-mutilation as a concept has persisted in his work, which includes painting, photography, sculpture and performance art. I have yet to see the current exhibition, but it appears that political protest persists in his work. With some irony perhaps, the opening of the exhibition coincides this week with the communist party conference in Beijing, and also with a week in which we have witnessed both a democratically elected US president and the ‘re-election’, by the army and party members only, of the Chinese head of state.